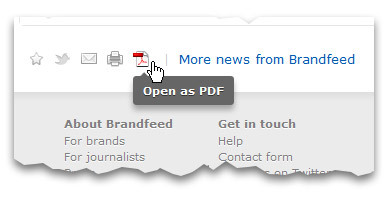 It had been quite some years since I last looked at the options for PDF generation in PHP, so when I needed to add PDF support to Brandfeed I did a bit of research. I ended up on this Stackoverflow thread which overall seems to recommend TCPDF with some fairly strong supporters for other libraries, including mPDF. I only needed to convert HTML documents to PDF. i.e. I didn’t need to programmatically draw vectors, or anything like that. That’s a pretty important prerequisite. When you consider how good HTML and CSS are for laying out a document, it makes you wonder why you’d do it any other way. The catch is that your PDF generator needs to render your HTML as well as a browser does. Anyway, I thought I’d share a few things that I encountered while getting this integrated to my PHP application. I decided to execute the wkhtmltopdf binary via the shell and use PHPs procopen and related functions to pipe in my HTML and grab my PDF without faffing around with temporary files. I’m unsure of the comparative overheads in using the shell versus using a PHP extension, but it works very well regardless. I’m not an expert sysadmin but I’ve compiled plenty of software on the Linux and Mac command lines and this did not go well. It requires first compiling the open source version of Quicktime, which is almost 1GB of source code and was building for over an hour before I hit Ctrl-C on my Mac. It failed first time on my Linux machines… basically I gave up. Static binaries are available for both Linux and Mac, and they worked fine for me. I recommend saving yourself the pain and just using them, even if they’re not available for the latest version of wkhtmltopdf. (The Mac binary is a couple of versions old). On my Linux servers, after installing a whole bunch of X11 stuff I probably didn’t need and definitely didn’t understand, I discovered via the comments here that I needed to install the urw-fonts package. If you don’t have the fonts installed correctly you get black squares instead of glyphs.